In 2001, the GySEV, a independent operator in the Hungarian-Austrian border area, ordered five high performance locomotives of the type ES64U2 by Siemens, together with the MAV, the Hungarian state operator. Because the GySEV 1047 series is identical to the OBB 1116 series, it was possible, that 9 months after order placement, the 1047 501 was finished already. Between May and November 2002 the complete batch delivered. They are used for all sorts of trains in Hungary and Austria, but are also approved for Germany. This is possible because they have the EVM120 (Hungary) and Indusi (Germany and Austria) train signalling and safety systems and they have a traction system for 15kV AC and 25kV AC. Although these locos are high-performance locomotives, the GySEV uses them for all sorts of services, even for regional services. You have to look twice, but yes, this is not MRCE ES 64 U2-009. Here we see images of a GySEV locomotive: 470 505. The livery of both locomotives is almost identical. The livery of the machines celebrates the 25th anniversary of the Pan-European Picnic and the re-opening of the frontier between Austria and Hungary. BTW, GySEV 470 505 was previously running in a full themed livery about national hero István Szécheny. One colorful livery has therefore replaced the other one. Since today, GySEV locomotive no. 470 505 is in revenue service looking all fine again. Loc & More, the company that has produced the promotional livery of the locomotive, has replaced the damaged parts of the vinyls on side 2 of the locomotive. Around two square meters of vinyl was put on again. First commercial service: to Sopron with the IC 918 this evening. 2010-04-07 [HU] GySEV 1047 505 "István Széchenyi"
[HU] GySEV 1047 505 "István Széchenyi"
Siemens 20799 2002 ES 64 U2 Bo'Bo'-el GySEV "470 501"
Siemens 20800 2002 ES 64 U2 Bo'Bo'-el GySEV "470 502"
Siemens 20801 2002 ES 64 U2 Bo'Bo'-el GySEV "470 503"
Siemens 20802 2002 ES 64 U2 Bo'Bo'-el GySEV "470 504"
Siemens 20803 2002 ES 64 U2 Bo'Bo'-el GySEV "470 505"
In April 2002, the Siemens factories in Munchen-Allach completed the 1047 501. The remaining four machines followed within months. Curious detail is that the designation the GySEV selected for its new machines is in fact based on the Austrian numbering system. 1047 would be the most logical and correct service number for multi purpose electrics according to their system. As the OBB decided to use 1116, GySEV and MAV choose 1047. GySEV 1047 and 1116 series locomotives seem to attract bad luck; 1047 502 after its crash in October 2004. During 2006-2007, 1047 501, and 503-505 got their first general overhauls, including a complete repaint. As the 502 was being re-deivered after its reconstruction per 01.08.2005, this machine did not require a general inpection. On 14.08.2009, unit 1047 504 was presented in 'Haydn' design. Mozart being the first in 2006 (but on an OBB 1116 series locomotive), now another famous music composer got its own locomotive; Franz Joseph Haydn (1732-1809). 2009 was Haydn-year in Austria and Hungary. Design of this livery was made by Gudrun Gieblinger. On 07.04.2010, unit 1047 505 was presented in a special livery, commemorating the 150th anniversary of the death of István Széchenyi, state reformer and referred to as "the greatest Hungarian". In 2004 GySEV decided to extend its fleet with a second batch of 5 modern electrics. It was decided to sign a long term contract with the Austrian OBB for hiring five 1116 series machines, identical to the 1047 series, in stead of purchasing five new locomotives. Starting per May 2005, the OBB disposed 1116 061-065 to GySEV, for a period of 20 years. A fixed batch of 5 locomotives (1116 061-065) were selected, that got decorated with green and yellow adhesives on both sides and yellow GySEV logos up front. They kept their OBB service number and their red base livery. 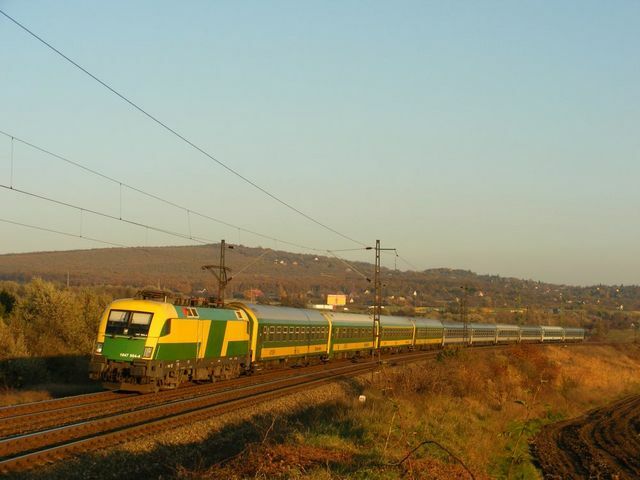 Now the GySEV has 10 machines at its disposal, the service domain of the 1047 501-505 was changed, as they now were predominantly used for services on the Hungarian part of the GySEV network. The rentals can be seen more on the Austrian side of the border. Siemens 20487 2002 ES 64 U2 Bo'Bo'-el ÖBB "1116 058-7"
Siemens 20488 2002 ES 64 U2 Bo'Bo'-el ÖBB "1116 059-5"
All GySEV 1047 series machines are equipped with Hungarian EVM 120 safety and signalling system, for services in Austria and Germany the Indusi system is on board. Additionally, the German LZB (Linienzugbeeinflussung) system is installed, an identification and safety system for locomotives, predominanty used when running at speeds over 160 kph. 1047 501 was delivered with blue front numbers and its GYSEV side markings over its entrance doors. All five GySEV 1047 series machines have grey frames and yellow and green painted bodies. Logos and markings are put on in blue. Locomotive 501 also got blue service numbers up front, difficult to identify on green painted front panels, being replaced by yellow ones in July 2002. Its' GySEV markings on both sides were placed over the entrance door, fragmenting it. This did not appeal to its new employer, as the 502-505 were delivered with complete name placed on the left of the entrance door completely. 502 (after its reconstruction in 2005) and 503 (from delivery) have right orientated front service numbers, by the other machines they are in the middle. 1047 501 and 502 were delivered with both Siemens and KraussMaffei markings, perforated in their frame ends up front and on every side. 503-505 only carry the name Siemens. This changed because the manufacturer of these machines changed its name in September 2001 from Siemens-KraussMaffei to Siemens after the latter one had increased its share in the total company from 25 to 75%. This of course has to be visible on the products right away! As for all other ES64U2 type machines, Siemens also had to replace the GFK roof tops of 1047 501-505 in 2006.